And so it continues. Unai Emery has now coached five different teams against Barcelona on fifteen separate occasions and has yet to taste victory. He has managed to secure draws five times but has become accustomed to defeat with ten losses against the Blaugrana. His record perhaps does not reflect the problems that some of his charges have caused Barcelona. For the second time this season, an Emery side led at the Camp Nou before being overcome in the second half. Barcelona win at home yet again and yet again the performance was stuttering. A slow first half tempered by an improved second half performance. With both sides facing the second leg of their respective Cope del Rey semi finals midweek, it was inevitable that neither would field a full strength team. Interim manager Jorid Roura made six changes to the side that had faced AC Milan in midweek. Only Valdes, Alves, Pique, Iniesta and Messi began both games. Montoya, Mascherano, Song, Thiago, Villa and Sanchez were all recalled to the starting line up with Montoya deputising at left back. For Emery and Sevilla, Negredo, Reyes and Kondogbia all began on the bench with Babacar and Manu in the starting line up. Sevilla began with a rough 4-4-2 formation, Rakitic playing alongside Babacar but with the freedom to drift laterally and support Manu and Navas on the flanks. Both sides appeared to be giving some thoughts towards their forthcoming Copa ties initially. An early chance for Iniesta was blocked. A delay from the talented midfielder provided sufficient time for the defender to recover. Perhaps a more natural finisher would have released the shot earlier? Sevilla generally sought to stay compact and narrow, employing a mid level block with Babacar and Rakitic remaining high up the pitch. In response to this, both Villa and Sanchez tried to stay wide to stretch the Sevilla defence and create gaps which could be exploited but such opportunities were not grasped. Villa, in particular, made several good runs dragging defenders with him and opening space but passes often went elsewhere. In the 17th minute, a quick throw out from Valdes found Thiago who crossed the halfway line in possession initiating a quick counter attack. Villa was positioned on the left and in space but the midfielder failed to spot his team mate and turned back inside and the momentum was lost. Whilst Barcelona will never score the sort of goals that Real Madrid do on a regular basis, with blazing speed during a transition, this is an area that Barcelona need to improve upon especially when playing opponents who defend intelligently and resolutely. Emery has begun his time at Sevilla well, taking 10 points from 15 available points in his five league games to date. His record in all competitions prior to last night was four wins, two draws and two defeats from the eight games in charge. Yet Sevilla still languish in mid table with a European spot looking as far away as it has for large parts of the season. With his power and physique, the player is certain to play a pivotal role for Sevilla for the remaining part of the season. The main focus for Emery, in these closing months, will be to win the Copa del Rey semi final and triumph over Atleti, gaining a place in the final and a European spot in the process. For now, the Copa takes precedence. Sevilla need the funds available from a European run to tackle their financial problems. Barcelona began the second half in a brighter fashion and played with greater urgency. Sevilla were also being pressed quicker and forced into clearing the ball more often rather tan playing their way out of trouble. Tello replaced the ineffective Sanchez at half providing Coke with a new problem; the raw pace of the Barcelona youngster. 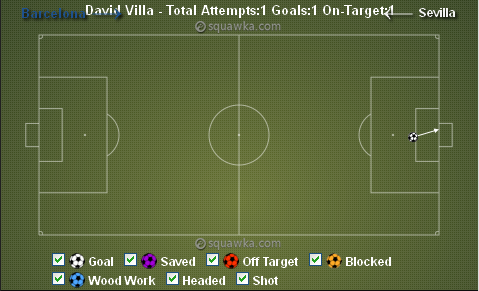 Barcelona drew level with Villa heading home from an Alves cross. The striker was the only Barcelona player in the penalty area and pulled off Botia to score. With the game opening up and the play more stretched, Tello had space. In the first half, Navas was able to provide cover for Coke against Sanchez but the full back was increasingly left isolated as Sevilla sought to gain a way back into the game. The wining goal arrived a few minutes later. Tello was in acres of space and received a pass from Messi, who darted into the centre of the area. Whilst all the Sevilla defenders ran back towards their goal, expecting a low cross , Tello pulled the ball back for Messi who had held his run slightly, providing him with a yard of space. Sevilla though, attempted to get back into the game and play continued to be open and move from end to end. Barcelona made two substitutions to regain control of the game. Firstly, Xavi was introduced in 68 minutes followed by Busquets coming on in 78 minutes. There was one more chance for Sevilla to earn a point in the 74th minute. Song was caught ahead of Rakitic providing the Croatian with the space to receive the ball, turn and then slide a through ball into the path of Negredo. The frontman blazed over with only Valdes to beat. Tello had a final chance to place a greater winning margin between the sides but, as he did against Granada last week, he fired high. Perhaps a little more composure is needed from the young striker. During the earlier part of the seasons there were those commentators who questioned Dani Alves commitment. The Brazilian’s head seemingly being turned by potential lucrative moves elsewhere. For a short spell, Montoya performed admirably at right back and offered reasons why he should be the long term successor to Alves. That will happen but not yet. Alves has recaptured his best form in a Barcelona shirt. At the start of the second half, Villa was moved into a central position with Messi operating behind him. 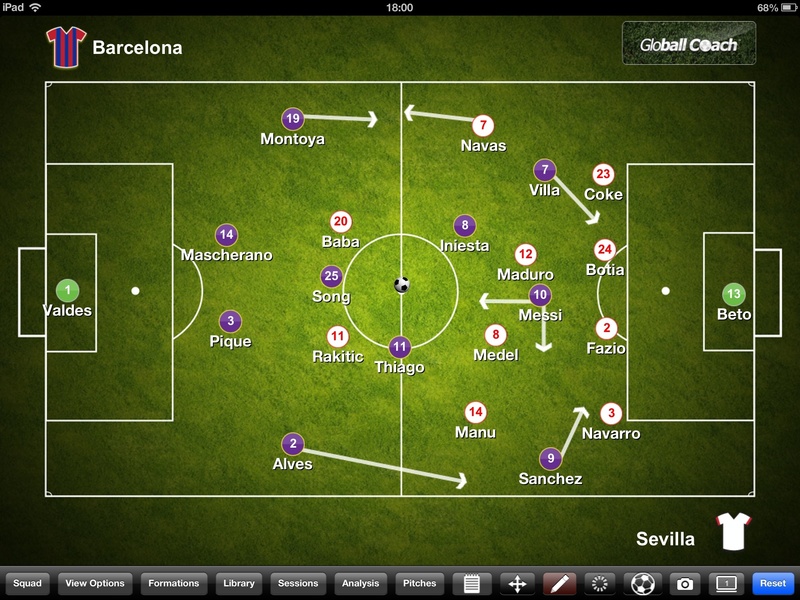 Tello replaced Sanchez and occupied the left wing meaning that no player other than Alves was on the right handside. It’s a precarious situation and requires the balance to be struck perfectly to avoid the opposition taking advantage and creating 2 on 1 situations against the full back. Alves maintained a high and wide position for much of the second half s shown below. The ability of Alves to operate alone on the right side should not be underestimated. One aspect which could still be improved upon is his passing into the penalty area. Despite attempting 100 passes, only four of these were into the area with just two being successful. This cannot solely be attributed to Alves tough. For players must be in the penalty area for the full back to pass to. The provision of the assist for the opening goal of the game from David Villa is proof of his quality when options exist. David Villa – He Shoots, He Scores. For all of Barcelona’s control in games, their ability to remorselessly control possession, the use of midfielders in advanced positions coupled with Messi’s deeper positioning can often leave Barcelona appearing toothless in attack. There is a lack of a cutting edge to complement their possession. Opponents know if they close out Messi, they significantly reduce the chances of Barcelona creating or scoring. The striker had one attempt at goal and scored but his performance was more than that. It was the runs into space, pulling defenders with him and creating openings for others. It was the reference point in attack that Barcelona often lack. With Messi playing as a classic no10, it kept the Sevilla central defensive pairing of Botia and Fazio busy. It’s an option which Barcelona must retain within their arsenal. It’s why Villa did not move during the January transfer window and it’s why he must find a starting berth in the side more often. A difficult week concludes for Barcelona with two unimpressive, but nevertheless wins, and a defeat. The problem is that another difficult week approaches for a side lacking fluency and defensive worries. With such a large lead over Atleti in the league, the three points, as welcome as they are, were not the primary issue last night. The performance arguably was. Sevilla head into their contest with Atleti knowing that they almost snatched a draw had Negredo shown more composure with his finish. Their season remains alive as long as their Copa involvement continues.